The 15-minute precipitation data for this station are temporaryand will only be displayed for 120 days. Although the instrumentation is calibrated at least once/year, the temporary classification means that documented routine inspections and other quality assurance measures are not performed that would make the data acceptable for archival, retrieval, or future use in general scientific or interpretive studies. LOCATION.--Lat 43°53'50", long 75°03'05" referenced to North American Datum of 1927, Herkimer County, NY, Hydrologic Unit 04150101, in gate house at Stillwater Dam on Beaver River, 2.5 miles upstream from Moshier Creek, and 7.5 miles west of Beaver River post office. PERIOD OF RECORD.--May 1908 to current year. Prior to February 1925, month-end contents only, published in WSP 1307. February 1925 to September 1937, published in WSP 824. Prior to October 1999, daily observations at 0800 hours. GAGE.--Water-stage recorder. Datum of gage is NGVD of 1929, adjustment of 1912. To convert elevations to NAVD of 1988, subtract 0.11 ft (VERTCON). COOPERATION.--Supplemental elevation record and capacity table provided by Board of Hudson River-Black River Regulating District. REMARKS.--Reservoir originally formed about 1885; enlarged at various times and in 1924 enlarged to a usable capacity of 4,623 mil ft³ between elevations 1,650.3 ft and 1,679.3 ft (top of 24-inch flashboards in place throughout year). Elevation of gate sill of lowest outlet, 1,642.3 ft. Capacity below elevation 1,650.3 ft, 100 mil ft³, is included in records presented herein, but is not ordinarily available for release. Figures given herein represent total contents. 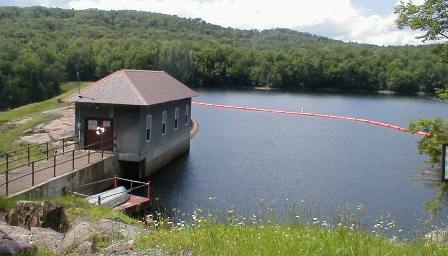 Reservoir is used to regulate flow of Beaver and Black Rivers for flood control, power development and general public welfare. EXTREMES FOR PERIOD OF RECORD.--Maximum observed elevation, 1,680.15 ft, Apr. 29, 2011, contents, 4,969 mil ft³; minimum observed since first filling, 1,644.80 ft, Mar. 25-27, 1949, contents, 8 mil ft³.